Home Healthcare Agency is a locally-owned and operated home care service provider noted for our commitment to quality care. We have been proudly serving the people of Minnesota. We promote high standards in taking care of our senior patients and we never disappoint their expectations. Our staff provides comprehensive and professional home care services in Roseville, Minnesota to anyone who needs our services. We make sure that our staff is capable of giving health assistance to take care of our patients. 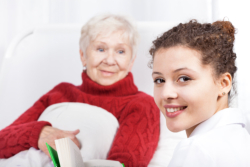 Here at Home Healthcare Agency, we strive to provide comprehensive services to your loved ones and help them recover in a place where they feel comfortable. Our mission is to provide the best quality health care to our clients in an environment that exceeds their expectations, while at the same time collaborating with communities and government agencies to improve clients’ health status. We want our clients to feel cared for and happy every day and satisfied. To create a most comprehensive resource that provides access to all patients who needs residential care services. Our values promote delivering quality services through a person-centered approach in which participants feel an atmosphere of warmth and caring. Our philosophy is a simple one. We want to understand our clients’ holistically, considering all aspects of their lives so that we can better understand their health and social issues, concerns, and needs. This allows us to focus on developing networks and partnering with healthcare providers to best serve our clients. Our objective is to offer excellent quality services to eligible individuals with health problems and disabilities to build and maintain their optimal capacity for self-care. A Leadership principle and philosophy that allow employees to achieve their financial success and allow clients to live in the highest quality home care services possible. Our agency is an equal opportunity home care services provider and employer. Home Healthcare Agency does not discriminate against any person on the basis of race, color, national origin, disability or age in admission, treatment, or participation in its programs, services and activities, or its employment.